At Interbike this past week a startup company was showing off a new entrant into the crank spindle power meter world. The Dyno Velo power meter is currently planned to hit production next year, for a target price of $399. This target price is inline with other left-only power meters as priced today (i.e. 4iiii at $399). 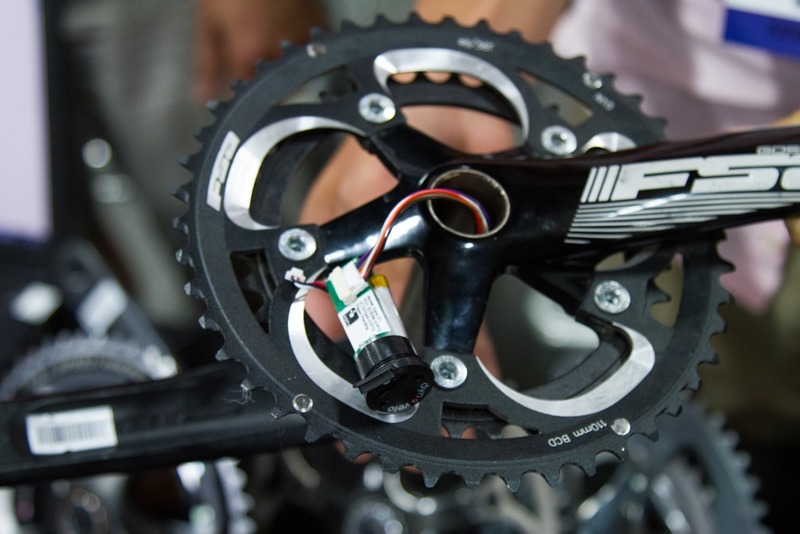 Using the crank spindle (within the bottom bracket region) for power is certainly not new however. We’ve already got ROTOR with their INpower, then there was Ergomo in the past, and also more recently Ashton Instruments is working on their product for next year as well. 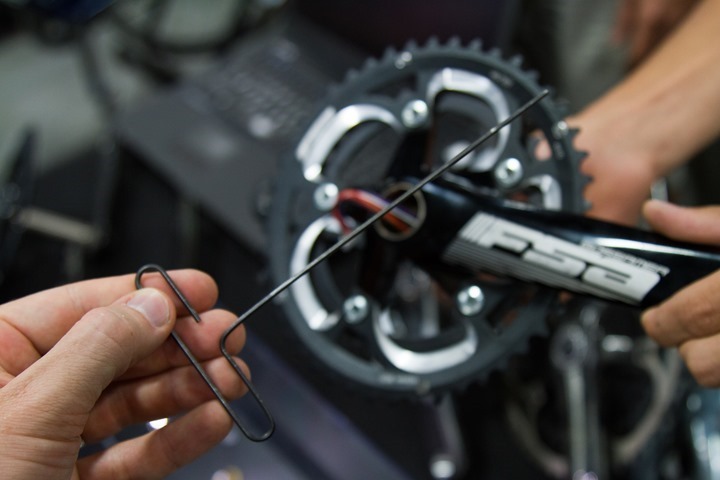 It’s an area that’s appealing to companies because of relatively broad compatibility, plus it’s theoretically easier to sell to/through bike shops and bike manufactures than crank based solutions which can have more complex installation routines. I got to spend a bit of time with the Dyno Velo folks as they walked through how the unit works and how you get it installed. So let’s dive into it. 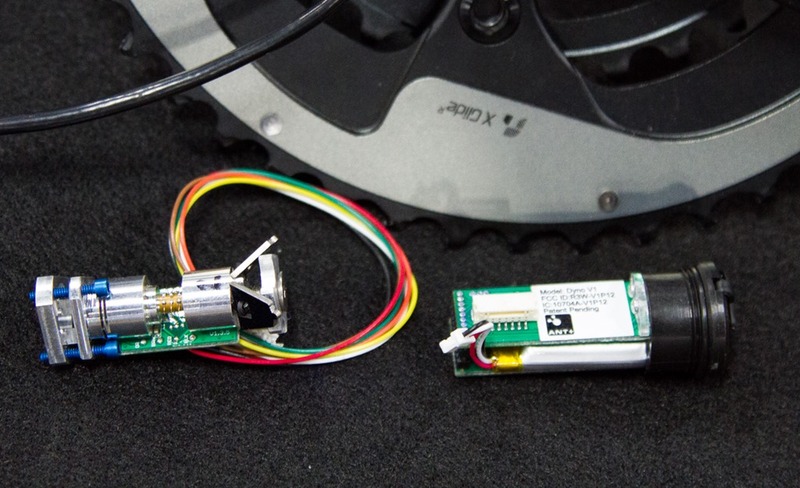 Seen below are the two components of the Dyno Velo power meter. One is the ‘torque transducer’ (left), and the other the electronics module (right). 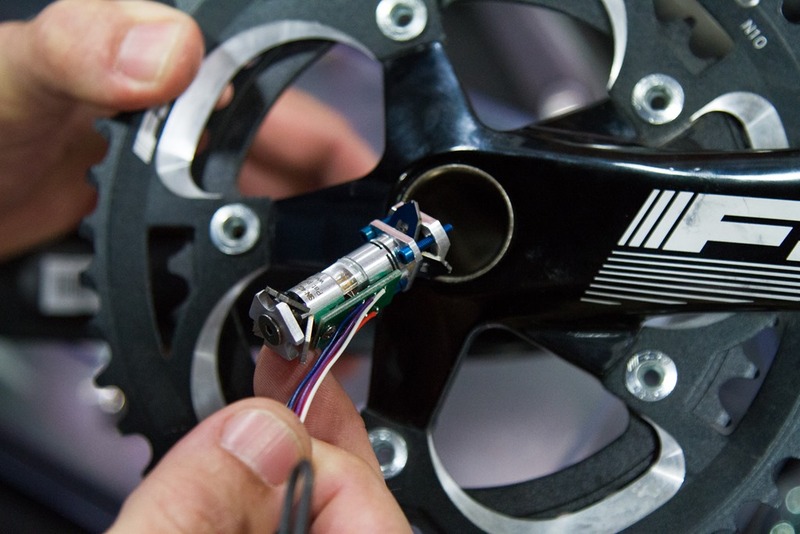 The torque transducer is basically a fancy term for the thing that measures the twisting inside the crank spindle, and then spits out a figure that exclaims your power output. Meanwhile, the electronics module then takes that value and relays it via ANT+ to head units the world around. To start, you’ll plop the torque module down into your crank spindle by holding the wires and pushing it via the included tool. This is sorta like ice fishing (speaking of which, while in the US last week I learned there’s an entire reality TV show dedicated to ice fishing, crazy!). Then, you’ll take this pokey tool and push it down and then use the screw tip on it to lock the transducer in place. What this does is actually expand out the arms on the transducer, sorta like someone holding their arms out inside an elevator – locking it against the walls. Next, you’ll connect the wiring from the transducer to the communications pod. With that, you’re done – the unit is ready and calibrated. 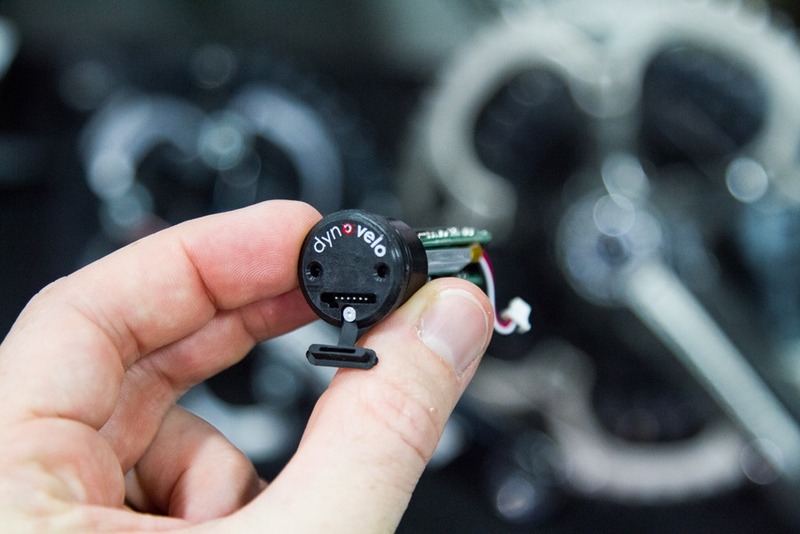 When it comes to usage, the unit will transmit total power and cadence via ANT+ to any compatible ANT+ head unit. It does not have Bluetooth Smart at this time, though they say it could be possible down the road. 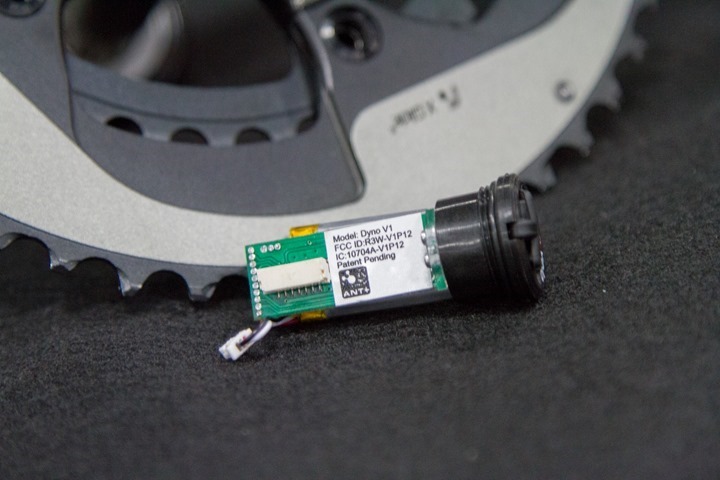 They also noted that they spent a crapton of time working on the ANT+ transmission side to make it the strongest transmission of ANT+ signal of any power meter out there, ensuring good connectivity to head units. They state a power range of 0w-2000w, and a cadence range of 30RPM to 200RPM, with an accuracy of +/-2% (as measured on the left leg). Again remember that with this location in the crank spindle, it’s only going to be measuring your left leg power, not total power. Thus, it’s identical to the power output as measured by other competitors such as Stages. 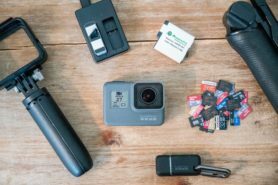 When it comes to charging, the unit uses a small charging adapter that connects to a small port on the front that’s covered by a rubber seal. The unit is rated at 20hrs of battery life, which is one of the lowest out there in the power meter market (if not the lowest). My only concern with the charging adapter is that the pins are super-fragile, and not well protected when it comes to sand getting in that port. 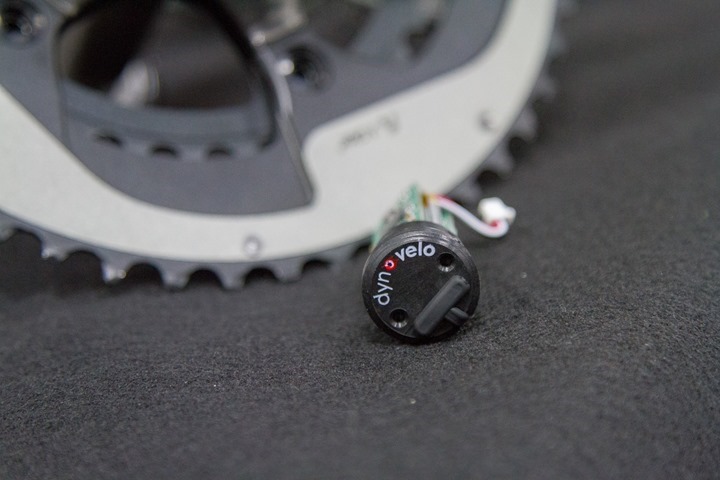 The Dyno Velo guys noted that they have done some cyclocross racing with the unit without issue to date, but I’m still going to maintain that charging port will not stand up to widespread use. But, that’s a relatively easy thing to adjust in the grand scheme of things. The unit has a waterproof rating of IP67. I did not at this time have the opportunity to do accuracy testing of the unit, which isn’t scheduled for release until sometime in “early 2016”. 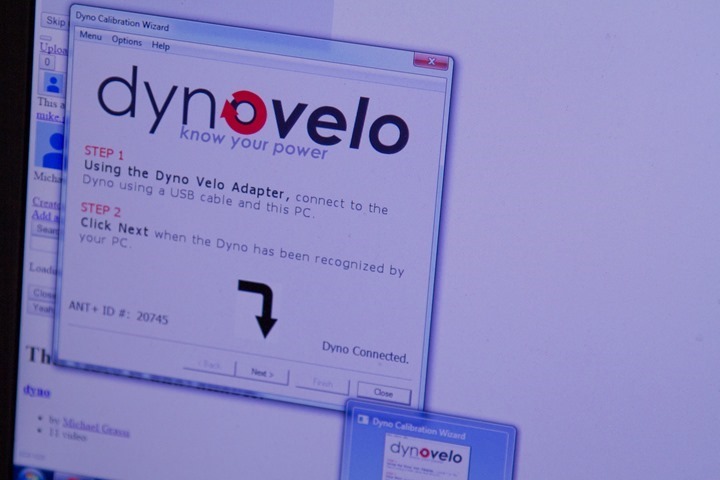 I think the guys from Dyno Velo are no doubt rather smart dudes. And they’ve in turn come up with what could be a cool product. Rather more precisely, they’ve come up with what could be a cool product for smart and geeky people. But not yet a cool product for the masses. Now I’m sure some will say I may be selling short consumers technical capabilities, and perhaps that’s the case. But the installation as it stands today needs more refining and needs to be more protected against user error (i.e. handling of the components). D) Reconsider the price, $399 is going to be borderline too much for a left-only unit with this level of installation complexity with others already on market at that price – by time you get to next spring. E) Reconsider battery capacity, 20 hours is really approaching a bit too low. Now, it’s easy to think I’m being hard on them. But that’s not so much the case. They’ve got a lot going for them. Their compatibility matrix with existing bottom brackets is strong, as is their mechanical design and how it locks (pretty cool). Same goes for their sealing system on the backside of the unit. 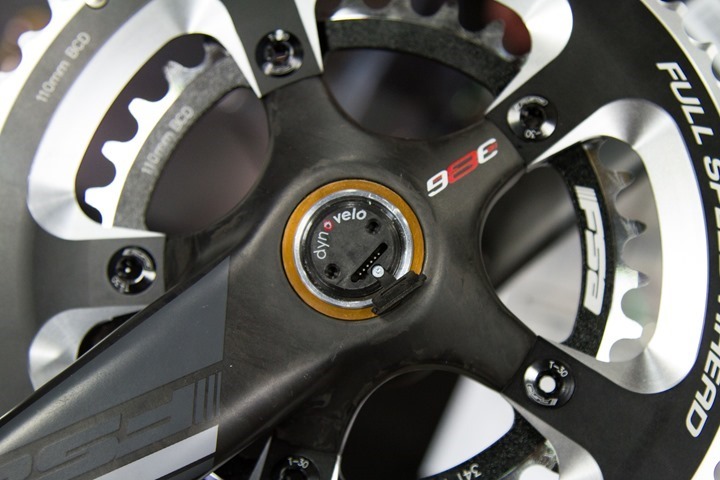 I definitely want to see more power meter options at cheaper prices. And if they can knock out the list above – I think they’ll be in great shape for next season. If you pull up with your right leg while applying power pushing down with your left leg, won’t the torsional force on the axle actually end up lower as opposed to the actual higher total power being put out towards the chainring? Hard to explain well in text only, but not really, at least in the way I think you mean. It will always measure the amount of power you are putting in with your left leg, regardless of what your right leg is doing. Inherently no better or worse than left crank or left pedal systems. Limitation is still L/R balance variations mean total power is not twice left power. In practice the friction/clamp type installation looks a bit flaky compared with something properly bonded. But I’m sure that will be proven or otherwise by our host’s rigorous testing. They may also want to reconsider the whole calibration with a certified weight thing, or at least figure out a way to make it easier to do. Having to get and weigh a 25+ pound weight seems slightly inconvenient. Not sure how they get around that (they obviously can’t include one in the box). If they distribute through B&M retailers, they could make sure that those retailers have a certified weight. A bit trickier to do if most of their sales are online. My point exactly. What a faff!! its enough to put me off right away. The bag of water thing that Watteam does seems like a good idea, although 25 pounds of water is over 3 gallons. 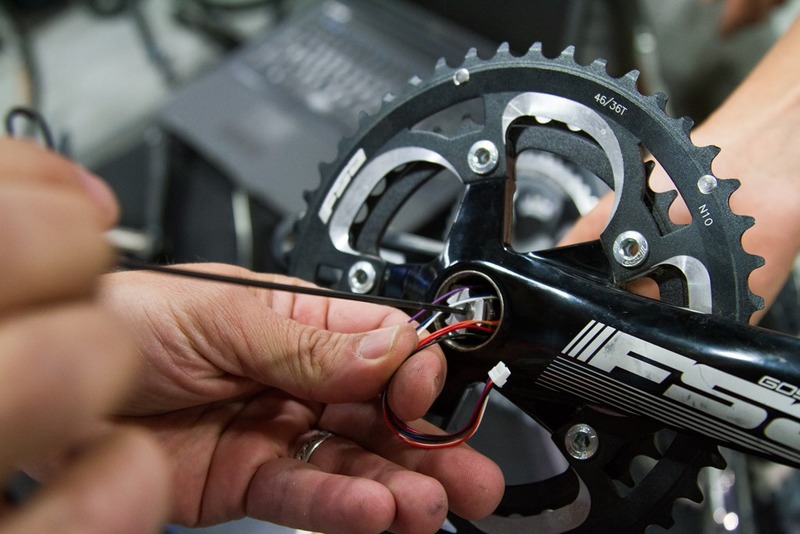 I can’t help but feel though that the cheaper the power meter the more fuss you seem to have to go through with calibration, weight stress…blah blah blah. It kind of defeats the purpose of it being cheap. I just want a cheap power meter, reliable and doesn’t need all this faff. Just fit and forget. 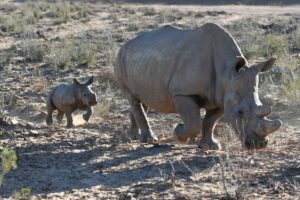 I don’t want to have to go to my local zoo, tranquilize and elephant, crane it onto a hoist to the hang it off my crank to get a stress test. After all thee years, why the hell can’t these companies just produce a power meter without all the fuss. ffs we put a man on the moon 50years ago and we still need to do this shjte? You’ve answered your own question. The actual components of the power meter are cheap. The equipment and technician time to factory calibrate quick enough to keep up with production aren’t. Any new entrant either has to cover their cal costs in the RRP or leave the customer to do the expensive bits. Power2max classic on the FSA Gossamer cransket- currently $499 (while they last). It’s about as simple as possible and is pretty damn reliable. Their other offerings aren’t as cheap but that’s because they’re clearing out the last of the Classic line. Sorry not for me, seems like a nightmare waiting to happen. You screw it into the hole with a tool, yeah right. Those arms aren’t going to hold it place with a couple of hard knocks on pot-holed roads, especially in the UK. Secondly, you have to take it somewhere to get it calibrated with a proper weight? come on, do me a favour. For one UPS don’t operate in the UK like they do in the US and secondly, has anyone tried getting anything measured accurately in a Post Office in the UK? its bad enough getting a stamp for a letter half the time. 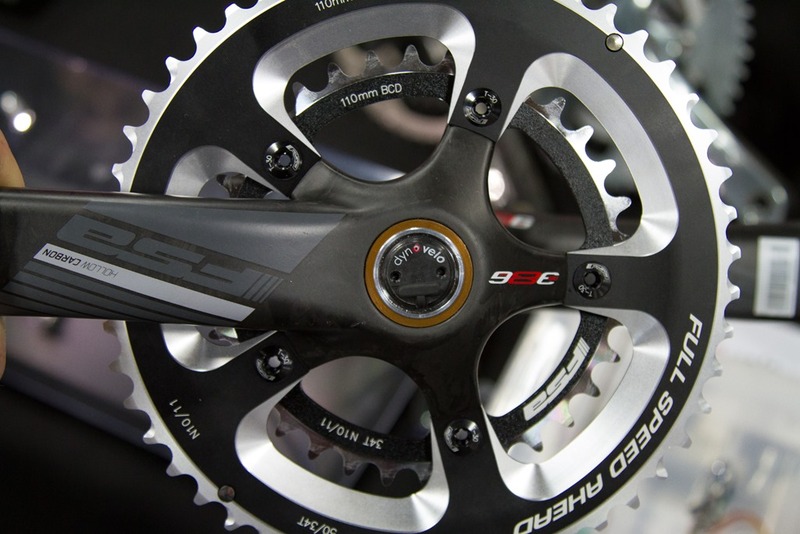 I would rather spend the extra and just buy a Power2Max crank or a set of BePro pedals. Most people who want to check their Power meters, weigh the weights at the post office. I certainly did to check my Quarq and SRM. Not a problem for the tech geek, but maybe too much for the average user. Well seeing at this price point it is aimed at the average user, by your own words its obviously too much. This is a fail waiting to happen. Best advice would have been tell them to stop wasting development money, this will never sell, unless they have a price point of $99 and target casual cyclist. 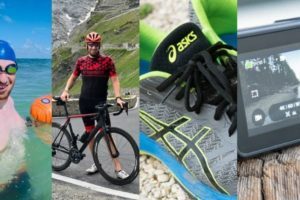 In the vast range of available power meters now available and prices now in a range where almost everyone can afford a power meter who wants / can use one can get one, and a pretty good one, who would buy this? Ha! I knew it! 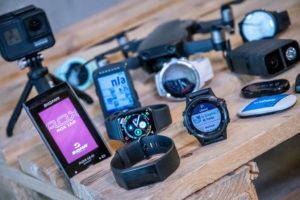 I just bought my Forerunner 225 and they come out with the 630 and 230 models. Whenever you buy something new, a newer version always comes out. It looks like both of them lack the optical heart rate, which was my primary reason for buying the 225. So I am not really too disappointed. Strangely enough the 230 model has activity tracking, but I do not see it mentioned for the 630 model. Those links don’t work for me. Are you saying one of them is supposed to show the new 630? I can’t find anything on the web when I search. 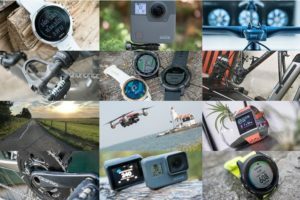 Garmin caught up to the leak and took the pages offline. No pictures but the most interesting thing to me was “audio prompts” on the 630. Did not go into detail but am assuming it requires connect + headset. Explains Ray’s tweet about needing a BT headset for a product evaluation. The 620 doesn’t have activity tracking either, does it? Not sure how audio prompts via headphones would work. If I’m running with Bluetooth headphones they’d be connected to phone to listen to music. I don’t think Bluetooth devices connect to multiple sources so it’d be either music from phone or audio prompts from watch (unless fr230/630 can play music). I’d assumed Ray buying headphones was for testing new Tom Tom watch which does include music. It is interesting how that will work. My guess is that a smart phone running Connect is required in the middle. Bluetooth Audio uses “traditional”, not low energy BLE so it would be more of a power hog. It could be BLE from watch to phone then phone pushes an audio message to the headset. 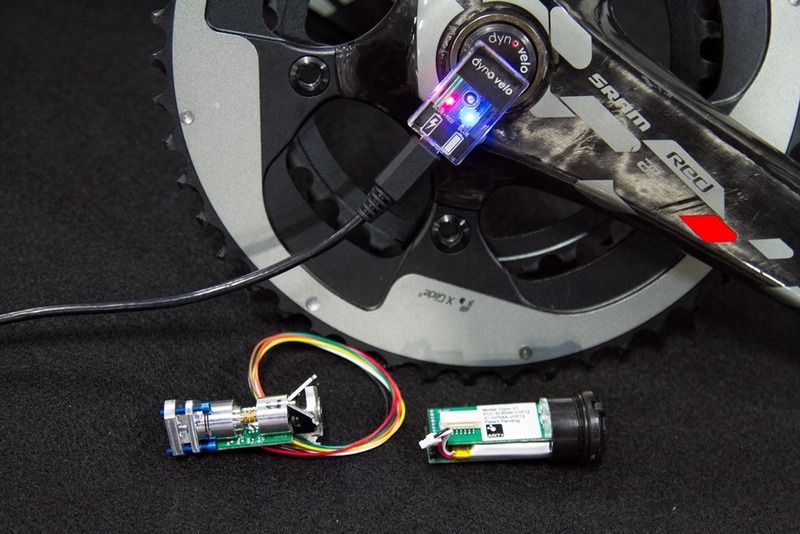 I do like the idea of a ‘standalone’ power meter that’s not dependent on another component like the vast majority of those on the market. They all have compromises to one extent or another, but for multi-bike use that didn’t force me to use one specific make of pedals etc, then this concept looks pretty good. If they could find a way to make the installation and calibration slicker and easier then I could be tempted by this concept. I think it would sell at $199 as-is. At $399 it should be much more bulletproof from a dirt/water perspective (durable enough for MTB), should have BT, and should have strong mobile app support. Oh, and be calibrated using the water trick that Watteam does so you don’t need to find a 25 pound weight and calibrate it. It’s IP67 as Ray noted in the article, there isn’t a more bulletproof standard for dirt and water that would be worth applying as neither can get in right now. Based on what I’m seeing and what Ray said, I’m still skeptical. On the MTB, it’s not uncommon to submerge your BB. Sure, IP67 is *supposed* to be 1M capable, which should be fine for MTB, but it’s just a bit close for comfort. Quarq was supposedly IPX7 and every time I submerged mine I’d be without power data for 30 minutes while it dried out. And it had no rubber door for a plug. *shrug* I can’t for the life of me understand what was “broken” in that time that could repeatedly dry out and still function, but it did. I guess that’s better than the battery-door-of-death on the Stages. Those seem *okay* as long as you electrical-tape them up decently from the start, too. If you don’t, well, plan on your warranty replacement fast if you ride in rain or submerge it the least little bit. Again, another IPX7 that doesn’t REALLY handle it well. In their defense, they did FINALLY apparently fix that. I can’t seem to find the rating on SRM’s units, but they are the one that’s repeatedly been flawless in this regard. I never have dropouts, never have had warranty issues, but have sent them back on about four year intervals for service. But the cost….ouch. But they “just work”, too. Oh, and I will amend…for $399 it also needs longer battery life. I think they’ve made us realize what might be the perfect spot for a meter. The hollow spindle area is great! Now just make it so that it goes in with a twist until it clicks and self-calibrates and you’ve got a sales explosion. I’d agree. If they can get it to the same theoretical plug and twist state as Ashton, it’s a great option. Any grocery store has the same, super accurate, scale as a UPS. You think a grocery store is interested in having you schlep in your dirty/sweaty 25 lb. free weights? LOL! 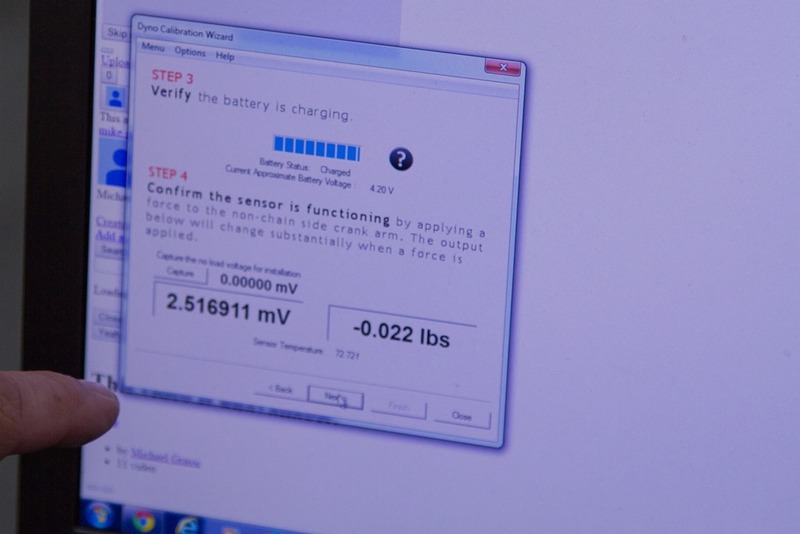 I’d go $299 with just one change, a battery that was substantially larger. But I can handle the modest challenges of installation and I suspect they are limited their market sharply with this level of difficulty on install and calibration. And at $399, I would never considered it with this size battery… and even with more battery at this price point I would look strongly at other options. The list of changes DCR recommends might well bring me into the fold at $399, but dunno. The spindle is neat spot though… no worries with the ongoing wear of, say, power meter pedals, the wheel choice issues with hub-based etc. Reading through the article the same issues as pointed out by Ray crossed my mind. I just add that the calibration weight would be a major issue for me. Here in Germany I can’t just go to the post office and have my dumbbells be put on the scales. The covered USB plug in and covering are trivial to correct in their final design. 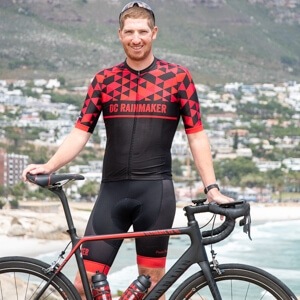 What is nice about this concept is that you could upgrade to a new bike and transfer the PM over, without worrying about buying the same crank. I think having the ability to calibrate ( not zero ) is something that would be nice to have. A lot of other power meters including Power2Max you have to just hope that they are right and have no way of checking. The rest of the items Ray mentioned definitely need to be addressed. How come the require a freaking heavy 25kg/50lbs weight to calibrate while other, pedal-based systems, merely need a 1kg/2lbs weight? Ray states 25 lbs, not kg. Still a lot of weight but doable. 25kg would be really tough. 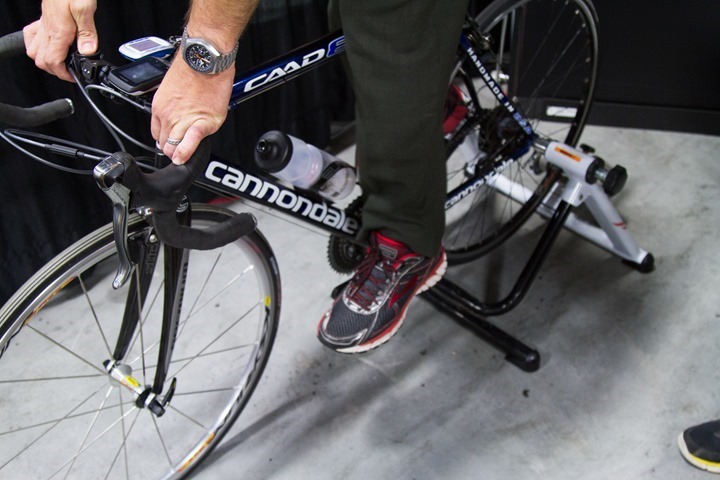 No other pedal systems use a 1kg calibration weight, provide a source. Larger weights result in better device calibration and accuracy. You wouldn’t use a 5kg weight to calibrate your body weigh scale and then use it to weigh 60-100kg people. You have not ensured that the scale is accurate in or near the range which you intend to use it. Very true. 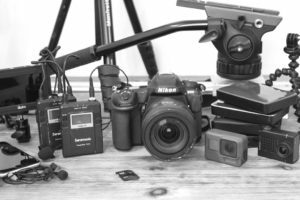 When I do instrument calibrations for work, we try to get at least 10 points that span the range of inputs that are expected to be experienced by the instrument with multiple measurements at each point. This ensures a good linear fit over the range of operation. I hope this is what other companies where the meter comes calibrated such as powertap, quarq, power2max etc do. A one point cal can be adequate, but is usually not the most accurate over the full range of inputs. I think this has potential and I can’t wait for the full report. I agree with Rays comments totally. I do wonder about the durability but I also think that no company would bring something like this to market without some vibration testing. Would they? The plug and unit may be IPx7 but what about water ingress over time from the connection to the NDS arm. Water for sure does work it’s way in through those threads over time. How was the certification performed on an installed unit in a crank? I see what you did there… LOL. These don’t seem like fundamental changes that are needed for this to sell. A dual Ant/BT chipset should be trivial, as should a larger battery and a micro-USB charge port. 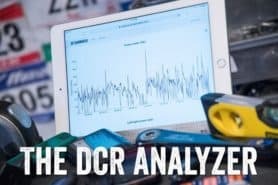 Any news about timeline for this powermeter?